This image shows a graben (a trough formed when the ground drops between two parallel faults) and a lava flow in the Tharsis volcanic province of Mars. North is up. The image covers an area about 6 kilometers (4 miles) wide. Relations like this can be used to establish the relative ages of features on the surface. The graben is from the upper left to middle right of the image. The lava flow is from lower left to upper right. 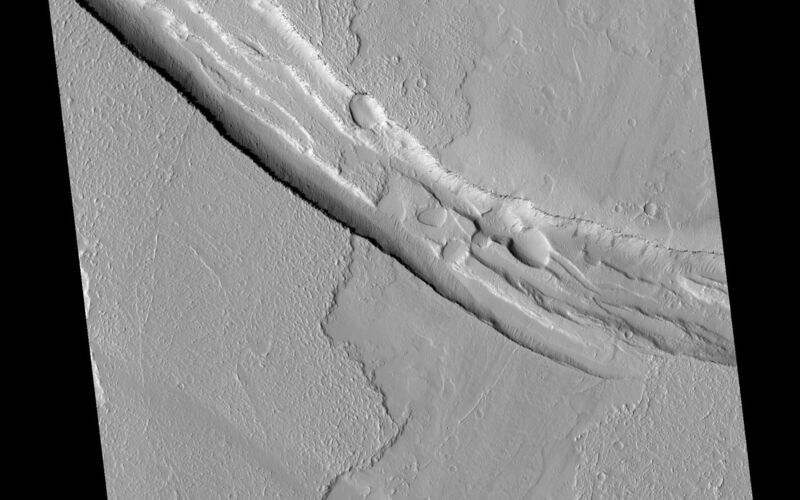 In this case, the trough cuts the lava flow, indicating that it is younger. If the trough existed when the flow occurred, lava would have spilled into and flooded it before the flow was able to proceed to the north. 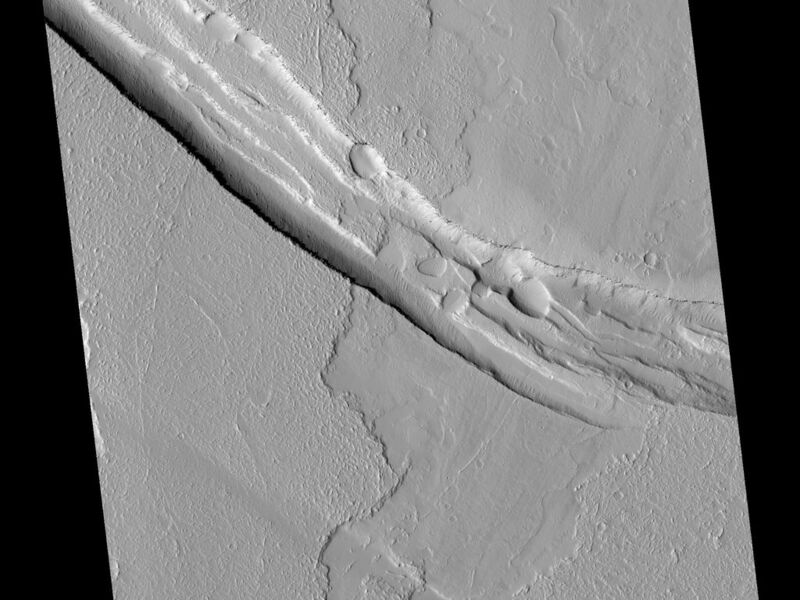 Another interesting feature in this lava flow is the trace of a central channel, indicated by two roughly parallel linear features within the flow. After the first lava flowed across this area, the rest of the flow was probably concentrated in this inner channel. The channel was still full of lava when the flow stopped, and so the surface is still at the same height as the rest of the flow. This image is one product from an Oct. 13, 2010, HiRISE observation catalogued as ESP_019747_1975, of an area centered at 17.4 degrees north latitude, 235.9 degrees east longitude. 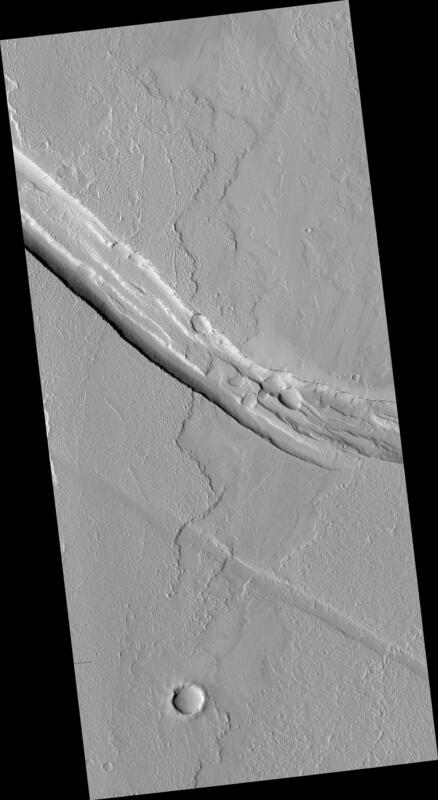 Other image products from this observation are available at http://hirise.lpl.arizona.edu/ESP_019747_1975.